More thoughtful storage solutions, a deeper freeboard and sleeker styling are just a few of the exciting improvements made to the fully revamped 175 Bowrider, the best-selling fiberglass boat in the world for nearly 10 years! The redesigned motor box features more sound insulation for a quieter ride, tie-downs for securing tubes, and a flat, recessed surface that functions as a table. The worlds best ticket into the boating lifestyle just got even more rewarding. Solid construction and heavy-duty marine-grade vinyl stand the test of time. 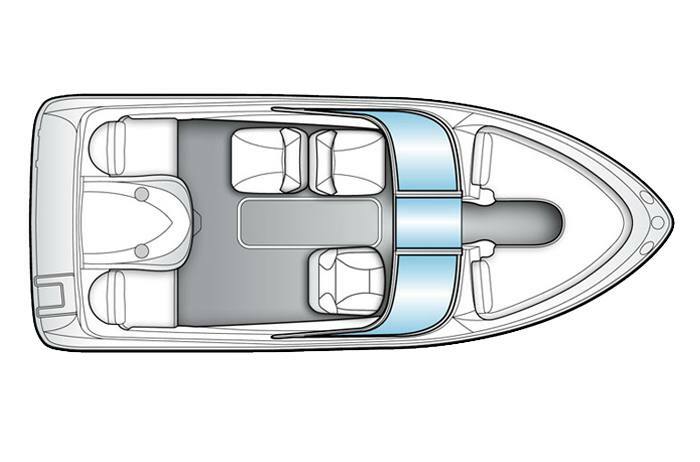 Removable rear seat cushions provide easy walk through access to transom. Added sound insulation on motor box provides a quieter ride. Getting in and out of the water is a cinch with extended swim platform and three-step ladder. Reel in a big one with the Fish Package option featuring trolling motor, livewell, fish finder and rod storage. Turbocharge watersports action with optional Flight Series Package, complete with wakeboard tower, integrated bimini, flight graphics and extended swim platform. Bimini Top with Boot: Retractable awning/sunshade over cockpit. Provides shade in cockpit when desired keeping passengers more comfortable (preferred in warmer climates). Bow Well And Cockpit Cover: Custom fitted snap-on covers. These durable covers keep your boat looking new longer by reducing the exposure to dirt, debris and sun. Deck Gel Stripe: Gelcoated accent stripe positioned on deck. Provides a visual enhancement to overall look and feel. Flight Graphics: Enhanced hullside graphics increase visual appeal both on and off the water. Swim Platform Extension: Molded fiberglass platform which attaches to the hull aft of the integrated transom platform. Greatly increases the amount of space on the swim platform. Particularly desirable for water sports, and accommodating multiple people in the transom area. Wakeboard Tower: Folding aluminum arch mounted directly to the deck designed as a wakeboard tow device with an elevated lift point (requires upgrade to high capacity trailer). Because of the high lift angle of the tow line wakeboarders are provided with more lift (more air time). Towers are easily folded to meet indoor storage restrictions. Tower accessories not included. Trailer upgrade is required. Option price includes additional freight surcharge. Waterproof Stereo AM/FM - MP3 Player Ready: Plug in your iPod or MP3 player and hold on because this waterproof 120-watt satellite-ready AM/FM Stereo/Controller (with inputs for iPod & Mp3 players) provides awesome sound with minimal distortion for the ultimate on-water party. Galvanized, High Capacity Upgrade: Trailer with confidence with reduced risk of trailer failures due to overloaded capacity. Galvanized, Swing Tongue Trailer: The corrosion resistant galvanized trailer is suitable for trailering a lighter load. Trailer with confidence with this durable and maneuverable method for getting boats to and from salt or freshwater venues. Free exchange for standard painted trailer. Painted, High Capacity Upgrade: Trailer with confidence with reduced risk of trailer failures due to overloaded capacity. Painted, Swing Tongue (Standard Trailer): Attractive painted trailer suitable for trailering lighter loads for freshwater use.